Dialysis is a treatment that takes over some of the work done by healthy kidneys. 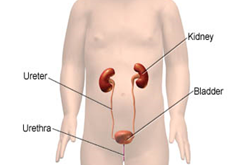 Your child needs dialysis when he develops end stage kidney failure. This is probably for life unless your child has a kidney transplant. 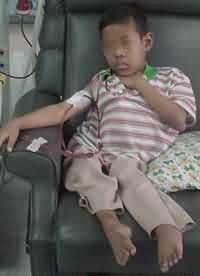 A young boy on haemodialysis machine. An artificial kidney (haemodialyzer) attached to a filtering machine removes waste and excess fluid from the blood. This is usually done in a specialized unit (haemodialysis unit) in a hospital setting, three sessions a week at four hours per session. Your child will require an access for the blood to flow to the artificial kidney. A surgeon will make an access by joining an artery to a vein to make a larger blood vessel called a fistula. The actual filtering is done by the lining of your child’s abdomen (peritoneum). This can be done both in hospital and at home and is the preferred mode of treatment for children. Your child will need a plastic tube (Tenckhoff catheter) inserted by a surgeon into the abdomen. One end of the catheter comes out of your child’s belly at what is called the ‘exit site’. CAPD involves four exchanges a day at home, done without the need of a machine, by parents or the child himself if he is old enough. An exchange is when sterile dialysis solution flows into the abdomen and drains out waste and excess fluid from the body. CCPD is done at home using a machine called a cycler. The cycler does a number of exchanges over an eight to ten hour period, usually at night when the child is asleep. Can anything go wrong with the procedures? blood clotting in the fistula, tubings and artificial kidney during dialysis. problem with drop in blood pressure during dialysis. infection of fistula or blood. infection of the peritoneum (peritonitis). infection of the exit site of your catheter. Strict hand-washing techniques as taught by the dialysis nurse during CAPD. Maintaining cleanliness of the cycler machine and all equipment used in CAPD. Contact your dialysis nurse or doctor immediately if you suspect your child is getting peritonitis or exit site infection. Restrict fluid intake as recommended by your doctor. Do not give your child high phosphate-containing foods. Provide a low salt diet if it is advised by your doctor. Promote exercise to help strengthen bones and to sweat to get rid of excess fluid, but remember not to let your child drink too much after that. Ensure normal school attendance as much as possible. Encourage homework or art and craft, and reading during haemodialysis sessions as these are good ways to spend the time.